Wise beyond her years. Brave beyond belief. Resilient beyond reason. McKaylee Borklund, an 11-year-old who lives in the Birmingham area, has had her life thus far shaped by her battle with brain cancer. But, she has not let it define her. Instead, as the Alabama girl shared in an essay for her sixth-grade language arts class, she has looked upon the face of adversity and seen the bright side, learning important, lasting life lessons along her journey. A responsibility that I have had for a little while now is cancer. I have brain cancer, and I was diagnosed with it on January 8, 2008. I go to St. Judes Research Hospital every year. I went through treatment when I was young for about 2 years. When I went through treatment, I stopped growing for a year, that is why I am really short. I also got hearing loss from the treatment [so] that is why I have hearing aids. When I was young it was hard to keep a good attitude and even now it is. One of my challenges of having cancer is going to the hospital every year. It’s hard and scary because of the needles, scars, and surgerys [sic]. However, my family started to turn it into a vacation. I was scared to go on the trips but my family made the trips fun. It’s hard to see sick kids, but it makes me feel like I’m not the only one going through cancer. Treatment was another challenge for me. Everytime [sic] I was done getting needles I would start singing and dancing. I wouldn’t want to eat, but my family would come up with creative ideas to get me to eat. 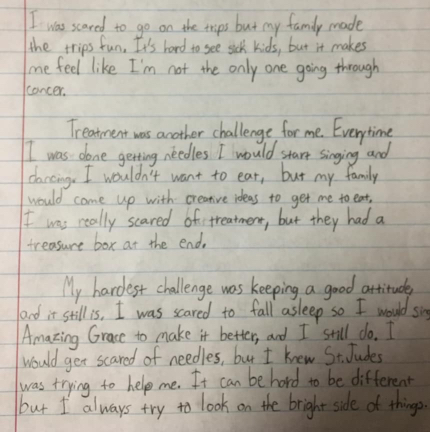 I was really scared of treatment, but they had a treasure box at the end. My hardest challenge was keeping a good attitude, and it still is. I was scared to fall asleep so I would sing Amazing Grace to make it better, and I still do. I would get scared of needles, but I knew St. Judes was trying to help me. It can be hard to be different but I always try to look on the bright side of things. The lessons that I have learned from having cancer is that it’s ok to be different. I also learned that being different is special. Three challenges that I have because of cancer is I have to go to the hospital every year, treatment, and keeping a good attitude. 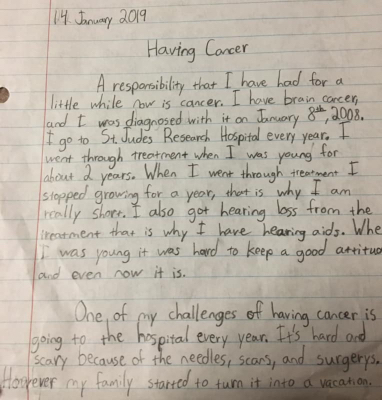 In an interview with Yellowhammer News, McKaylee’s mom said that the sentiments expressed in the girl’s essay are typical of how she has handled the decade-long journey, adding that McKaylee has had “an amazing attitude” throughout. McKaylee pictured during treatment vs. recently (right).